(left to right) Julian Jacome, Avianca COO, celebrates with Filippo Bagnato, CEO of ATR on delivery of Avianca’s first of 15 ATR 72-600s. 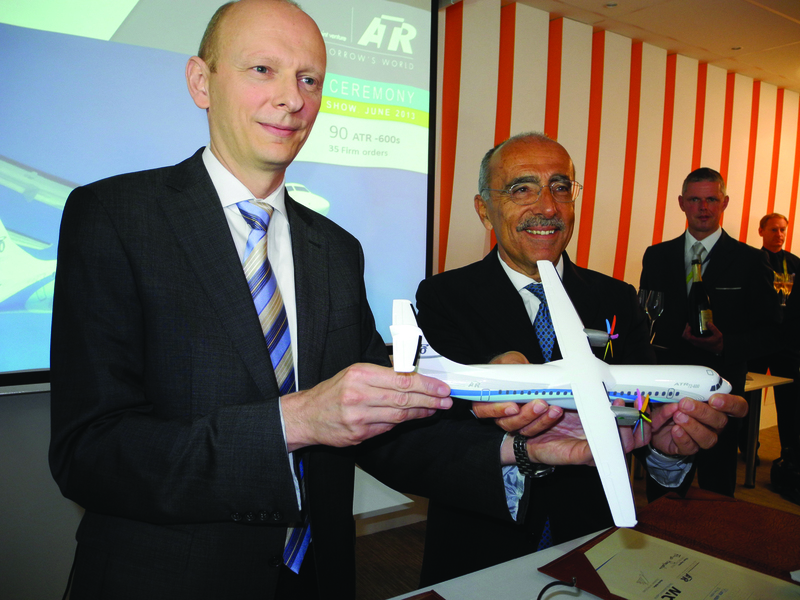 At a ceremony held yesterday at the Paris Air Show, Nordic Aviation Capital (NAC) chairman Martin Møller signed an order for 90 ATR turboprops, including 35 firm (30 ATR 72-600s and five ATR 42-600s), valued at more than $2.1 billion. The first ATR will be delivered to NAC in the fall. ATR is here at chalet B345 and has an aircraft at Static E.
In other ATR news, the company also held a ceremony yesterday to celebrate delivery of Avianca’s first of 15 ATR 72-600s that it ordered last year. The Avianca order is for 15 firm and 15 options, valued at more than $700 million. The ATR 72-600 delivered at the Paris Air Show features the new Armonia cabin in a 68-seat configuration. Avianca is gradually replacing its Fokker 50s and ATR 42s with the ATR 72s.